Martin Puryear. "Night Watch," 2012. Courtesy the artist and McKee Gallery, New York. In this week’s roundup Martin Puryear has new sculpture, James Turrell unveils a new Skyspace, Mark Bradford, Glenn Ligon and Julie Mehretu explore contemporary painting, and more. 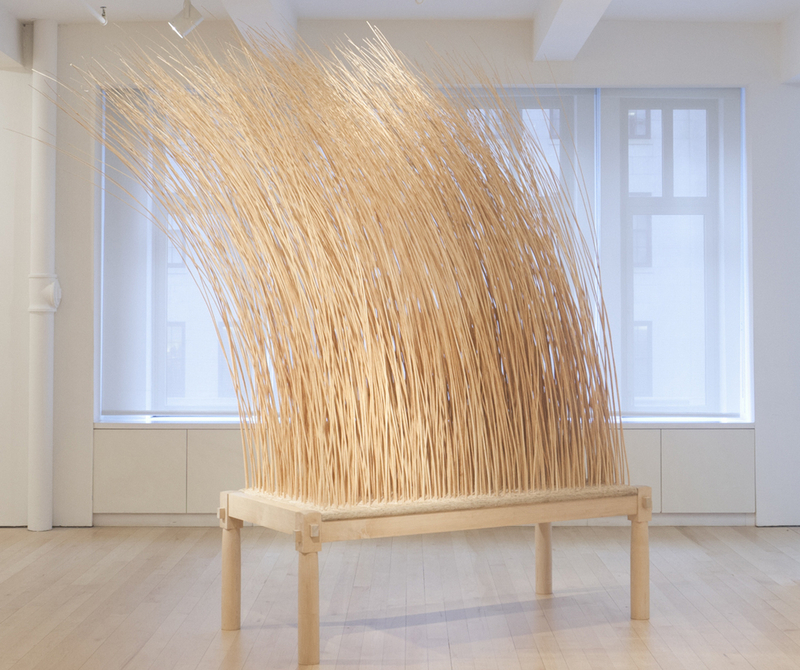 Martin Puryear: New Sculpture is on view at the McKee Gallery (NYC). This is the first exhibition of Martin Puryear’s work since his retrospective at The Museum of Modern Art (NYC) in 2007. In the current show some works are supported on wheels, some resemble relics, traverse the history of time, or spiral upwards towards unknown mysteries. The exhibition closes June 29. James Turrell‘s latest Skyspace is featured in CultureMap Houston, who interviewed the artist before the formal dedication at Rice University last week. The outdoor installation is encased within a large mound and topped with a elevated flat roof containing a large square window. Inside the space observers will see the Houston sky with new eyes when they peer through the ceiling as an interior lighting display changes colors for an otherworldly optical effect. Mark Bradford, Glenn Ligon, and Julie Mehretu are in The Painting Factory: Abstraction After Warhol at the Museum of Contemporary Art (Los Angeles). The exhibition examines how a painting tradition that was once seen as essentially reductive has now become expansive, bringing popular culture and current technology into its vocabulary. Rather than reducing itself to a narrow definition of the medium, it has re-emerged as an arena where opposing concepts can invigorate each other. This work is on view through August 20. Kiki Smith‘s I Myself Have Seen It is currently on display at the Scottsdale Museum of Contemporary Art (Arizona). The show features her use of photography to further explore ideas related to the human figure, the natural world, portraiture and fairy tales. More than 200 objects (including several sculptures and two video works) and 1,300 photographs suggest new meanings and possibilities for Smith’s art. This work is on view through May 20. Kara Walker‘s Harper’s Pictorial History of the Civil War (Annotated), by Kara Walker is on view at the Saint Louis Art Museum. The exhibition includes two pieces from the Walker’s 2005 portfolio, a series of prints that combines pages from an 1866 Harper’s publication with Walker’s trademark silhouettes. This show runs through August 26. In addition, SLAM has scheduled two free gallery talks on July 19 at 11 a.m. and July 20 at 6 p.m., led by Iver Bernstein, Professor of African and African-American studies and American culture studies at Washington University in St. Louis. William Wegman‘s recent postcard paintings are on view at Sperone Westwater (NYC). Artists Including Me features imagery from secondhand souvenirs, imaginary landscapes, and art about art. Wegman depicts a museum storage space with works from time periods and movements ranging from Medieval to Pop Art to the present, including one of the artist’s own Weimaraner Polaroid photographs. This is the artist’s fifth solo show at the gallery. The exhibition closes June 16. Matthew Barney collaborated with author Steve Hughes on a Stupor “zine” that is the result of Hughes being hired to do construction and land-clearing work for Barney’s latest film project, shot in Detroit in 2011. Washed in Dirt features four stories chosen by Hughes on pages designed by Barney. Charles Atlas‘s current exhibition, The Illusion of Democracy, is on view at Luhring Augustine (NYC). It features two video installations never before seen in New York: Painting by Numbers, 2011 and Plato’s Alley, 2008. Atlas includes a new large-scale video work made specifically for this exhibition. The show continues through July 16.